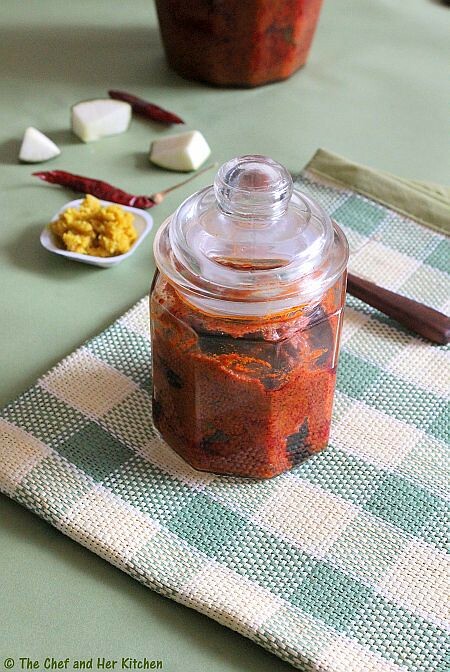 'Avakay (Raw Mango pickle)' can be considered as the king of pickles in Andhra. 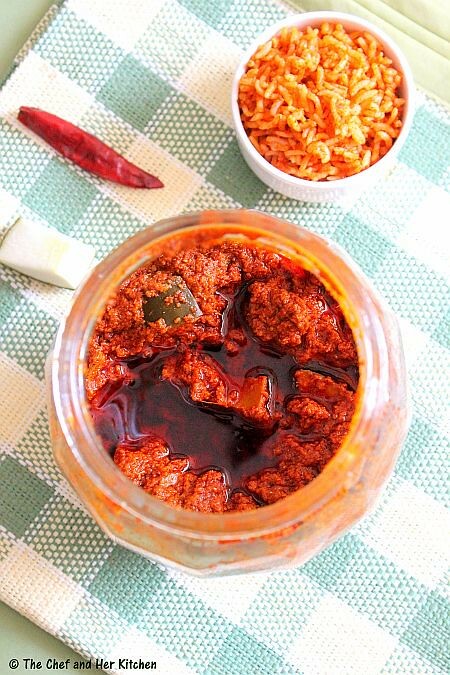 'Allam Avakaya' or 'Allapu Avakaya' is a twist to the regular avakaya and is prepared in northern part of Andhra.We absolutely love this pickle and I prefer Allam Avakay compared to other regular Avakay because of the extra flavor it has got. 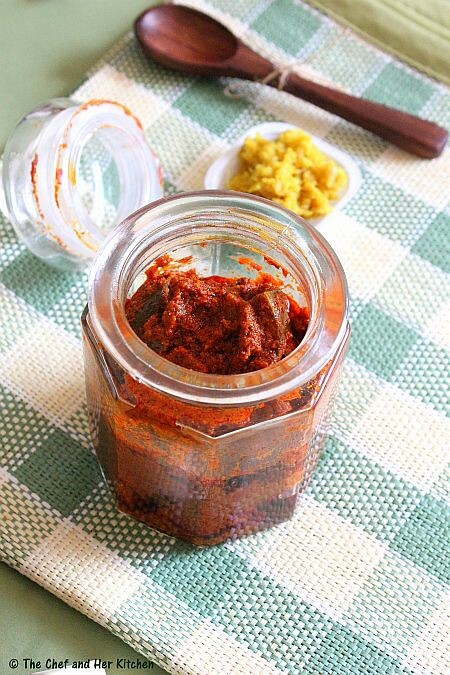 The preparation process of this pickle is almost similar to avakay with an extra addition of ginger-garlic paste,that adds a new taste to the mango pickle. Remove the skin of 2/3 cup garlic pods and approx 10 " ginger(should come upto 2/3 cup ginger after chopping) and wipe with a dry cloth and let them dry on a kitchen towel for 1 hr.Grind to a fine paste. You should use equal quantities of ginger and garlic for the paste and we need 1 cup of ginger-garlic paste for this pickle. Add ginger garlic paste to the above mixture and mix well. 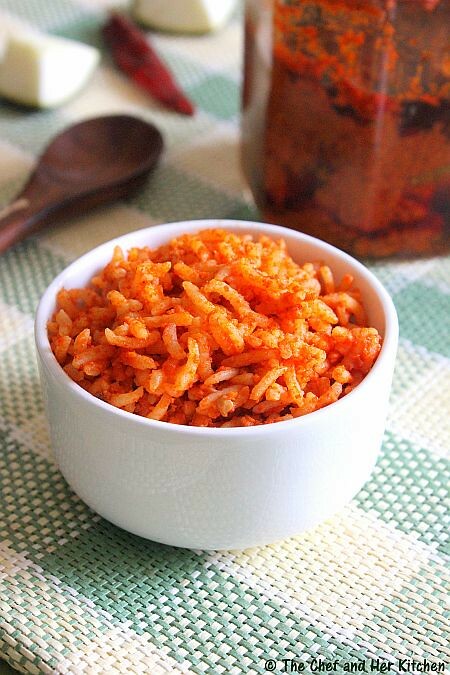 Serve it with hot rice and ghee.You can serve it with mudda pappu(mashed up cooked toor dal) or pappula podi(spiced up fried gram powder) and ghee which are classic combos with avakaya. 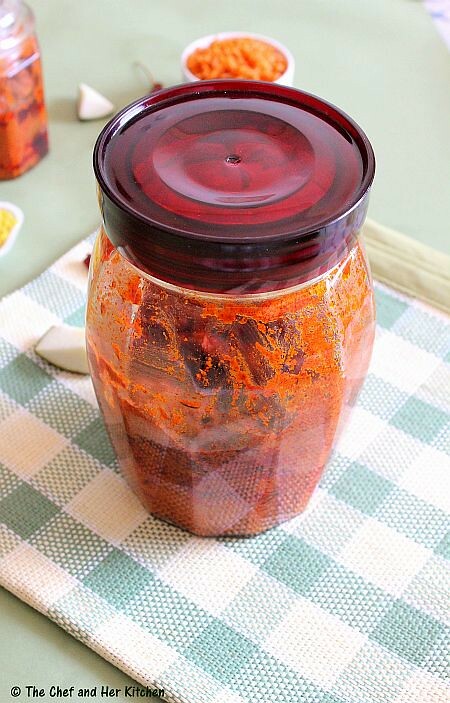 Use red chili powder which is specially used for pickles as this variety gives a nice and bright red color to the pickle and also it is not very spicy.My MIL brought a packet of "Three Roses" brand chilly powder which gives a bright red color and also it is not very spicy. You can easily double or triple the recipe,the basic rule is to use 4 cups of mango pieces with 1 leveled cup(1 cup minus 3 tbsp) salt,1 cup red chili powder,1 cup mustard seeds powder and 1 cup ginger-garlic paste. 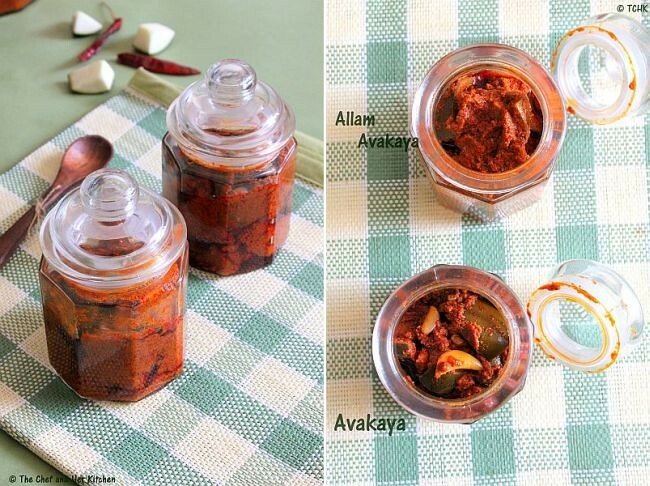 Did u notice the difference in between the two pickles 'Avakaya' and ' Allam avakaya'.The one with garlic pods peeping out is the regular 'Avakaya' pickle where as the other one is 'Allam Avakaya'. Haven't yet got around making mango pickle. Recently my in-laws sent us 2kg of homemade pickle. After taking some out from the triple-packed bag, I left the remaining in there for 3 months instead of keeping in fridge. 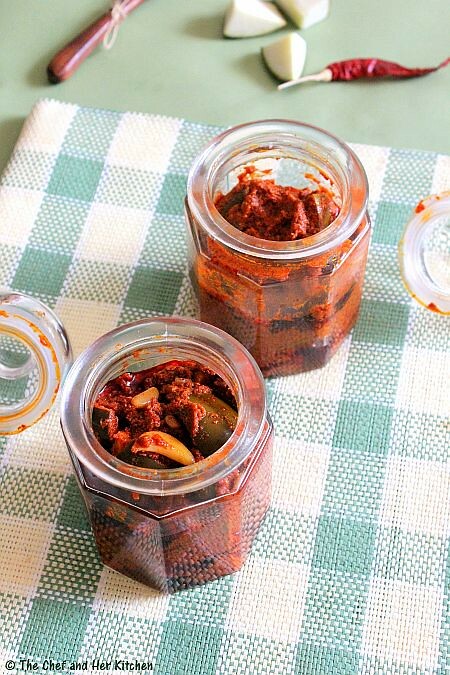 Tangy yummy pickle....best with curd rice! Seriously you are killing me with your fabulous pickles. I love avaka. WIth garlic is something I would enjoy more. What beautiful clicks. Nice. I tried this Avakai flavour this season for the firs time. My mom made it and the taste was so heavenly.Your post has really inspired me to make it. will surely try it out. 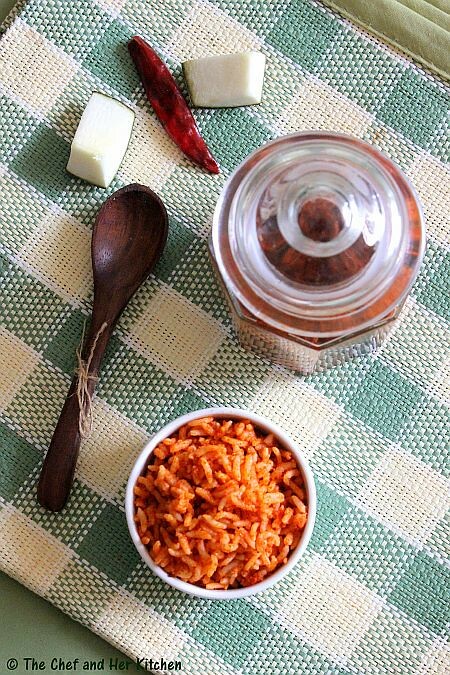 Looks mouthwatering, esp the rice mixed with pickle! Came across your site today and totally bowled over with your pickle recipes. I have a question please if you don't mind. 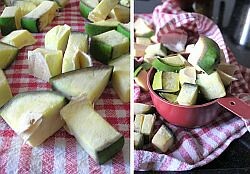 I would like to make this pickle but the mangoes from my garden are so stained that i would not like to use the skin. Would it be okay to make this recipe with skinless mangoes? AFter making pickle i didnt keep aside for 3 days..i just stored in container..does my pickle will get spoiled..please tell me..